Samsung has just announced the ATIV Tab 3, a 10-inch Windows 8-powered tablet, that is thin and light, and powered by an Intel Atom chip. 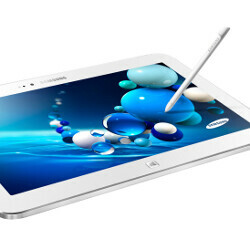 Moreover, the Ativ Tab 3 supports 3G and 4G LTE connectivity, and features the Samsung S Pen for sketching with an improved S Note 2.0 app. The 10.1-inch display features a resolution of 1366 x 768 pixels, reminiscent of many laptops, but not as sharp as the "Retina" displays of say the iPad or Nexus 10. Pixel density comes at around 155ppi. Designwise, the Samsung Ativ Tab 3 has looks similar to those of Samsung’s Galaxy series and measures just 8.2mm thick with a weight of 550 grams. It will be offered with or without a keyboard, with the keyboard itself adding $100 to the price. Under the hood, the tablet runs on an Intel Atom Z2760 (Clover Trail) chip with 2GB of RAM and has 64 gigs of internal storage. The tablet is equipped with both a rear and front facing cameras. Its key feature is of course the full-featured Windows 8 that will allow you to run legacy desktop apps. The Samsung Ativ Tab 3 will be priced at $599 for the basic keyboard-less model, and $699 for a model with a keyboard book cover. $600 for a 1366x768 screen? Really Samsung? That was the first thing I thought. At the very least, put in more storage...my god that is an awful price for what you get. I found a deal on B&H for the Thinkpad Tab 2 for only $459, which I think is far more reasonable for the specs you get. But if you get it from somewhere else it costs about the same as this....which still makes it too much for the specs. And not even with Clover Trail+, but the old Clover Trail!!! I was nearly expecting Bay Trail already, and that´s all they offer... dissapointing. It's a Windows tablet man. Eventually I'd like to buy a tablet, but I've yet to be impressed by the design of any of the ones in the market today. I like Samsung, but they're mobile design seems a bit.. bland? I wonder why they used an underpowered Atom SoC instead of Haswell Y SoC like the i3-4010Y. That Atom is pure garbage when it comes to 3D performance. Wow is this thing overpriced or what? 2GB of RAM, 64GB of storage, and that dreaded 1366x768 resolution for 600 bucks? I could buy a 500 dollar laptop and swap the hard drive for a 120GB SSD. What a joke.